Self Directed Students may enroll anytime! Welcome to the fun and exciting sport of Truffle Hunting! This 6 week class will introduce you and your dog to the exciting activity of truffle hunting. Truffle hunting can boost confidence, develop problem solving skills and provide controlled exercise for your canine. 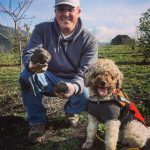 Whether you are just looking for a new game to play with your dog or your goal is to locate native truffles in the wild or on your orchard, this class will show you how to get started. Strengthen your relationship with your canine companion while gaining valuable skills that will transfer to other dog sports and activities you participate in. Full Students ($249) have access to all the class lessons as well as complete access to view the discussion forum for 1 year and one-on-one interaction with the instructors via the discussion forum for 6 weeks. Full Students also receive 1 year of exclusive access to the Best Of forum featuring past students and additional training footage. The Best Of forum includes selected video homework with feedback, discussions and problem solving topics. Full Student spots consists of one (1) handler and one (1) dog. Limited to 15 Full Students. Auditors ($149) have access to all the class lessons as well as complete access to view the discussion forum for 1 year, but cannot participate in the discussions. Unlimited. Self Directed Students ($89) have access to all the class lessons for 1 year, but have no access to the discussion forums. Unlimited. Hybrid Class Students have access to all the class lessons for 1 year and attend a 6 week live class. Must be enrolled in our Hybrid Truffle Dog Training Series. If the course is currently full, please contact us to be put on the wait list. Nosework is one of the hottest sports around and truffle hunting is a fun way to go a step further by applying those skills in the real world. This course is open to students and dogs of all levels and can provide a new challenge for nosework and tracking students – with edible dividends! Culinary varieties of truffles can be found all over the world, and it is possible they exist near you. Learn more about truffles by visiting our About Truffles page. 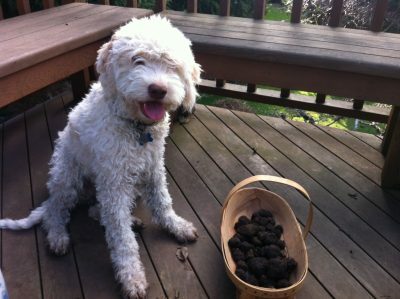 This class will introduce you and your dog to the exciting activity of truffle hunting. Truffle hunting can boost confidence, develop problem solving skills, and provide controlled exercise and mental stimulation for your canine. Truffle dog training is also a great way to build focus and to improve your human-canine relationship. It is especially fun and rewarding for dogs and handlers recovering from injury or with limited mobility as well as shy and sensitive dogs to build confidence. 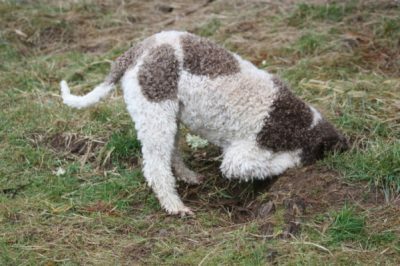 Whether you are just looking for a new game to play with your dog or your goal is to locate native truffles in the wild or on your orchard, this class will show you how to get started. This class is the first of a three part series of courses. Students with scent work experience who can meet the success criteria outlined in Introduction to Truffle Hunting may enter the class series at level 2: Developing A Reliable Truffle Dog Team. Proficiency must be demonstrated by submitting video evidence directly to the instructors prior to enrollment. Please contact us for detailed instructions if you are interested in this option. 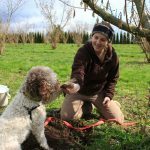 Full Students as well as Working Students in Hybrid classes who successfully complete the Truffle Dog Training series of classes will be offered the opportunity to work with Truffle Dog Company. When you register for a class, you will receive email confirmation of your account with Truffle Dog Company. If you do not receive an email, please check your spam folder and add our email: info@truffledogcompany.com to your safe sender list to ensure you receive important electronic communications regarding this course. Following registration you will immediately have access to your first lesson as well as the forums specific to your chosen course level. Course content is available by clicking on Introduction to Truffle Hunting under the My Classes menu. For Full Students and Auditors, the forum(s) will appear in the lesson sidebar as well as at the end of each lesson. Full Students will post questions and homework assignments for feedback in their individual forum topic. This allows each team’s progress to remain organized and easily accessible. Please allow 48 hours from time of purchase for your topic to appear in the forum. 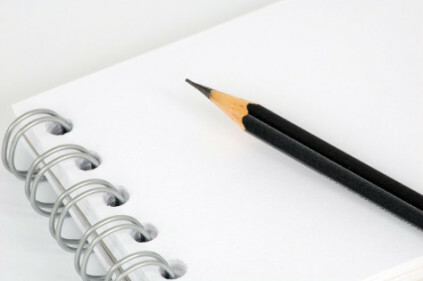 We create forum topics manually. If you signed up as a Full Student and a topic titled with your name does not appear within 48 hours of purchase, please contact us. The program commences with an introduction to basic groundwork for truffle scent training including games and exercises to strengthen your bond with your canine and boost confidence. It proceeds with a step-by-step guide to include how to create reliable alerts and strengthen searching behaviors. Identify the source scent of a truffle. Locate a hidden truffle indoors with limited distractions. Begin developing consistent alert behaviors. Some dogs progress much faster than others and may be able to perform more complex behaviors by the end of this course. When presented with more than one identical targets, the dog will correctly identify the one containing truffle scent with at least 80% accuracy. When given a verbal cue, the dog will correctly locate a single hidden target indoors 4 out of 5 times without showing signs of frustration or stress. When locating a truffle scent, the dog demonstrates an initial identifiable alert with 90% consistency. Each lesson will include written instructions and video demonstrations for exercises. Homework assignments for Full Students will include weekly video submissions for feedback as well as to demonstrate proficiency of the skills presented in each lesson. Full Students and Auditors will have access to the discussion forum. Full students may post questions and video for feedback from the instructors. Auditors may view the discussion forum but will not post. 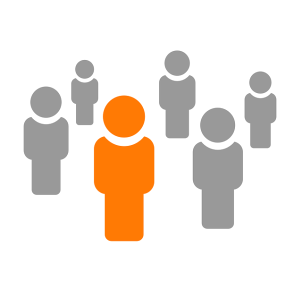 Self Directed Students and Hybrid Class Students do not have access to the discussion forum.